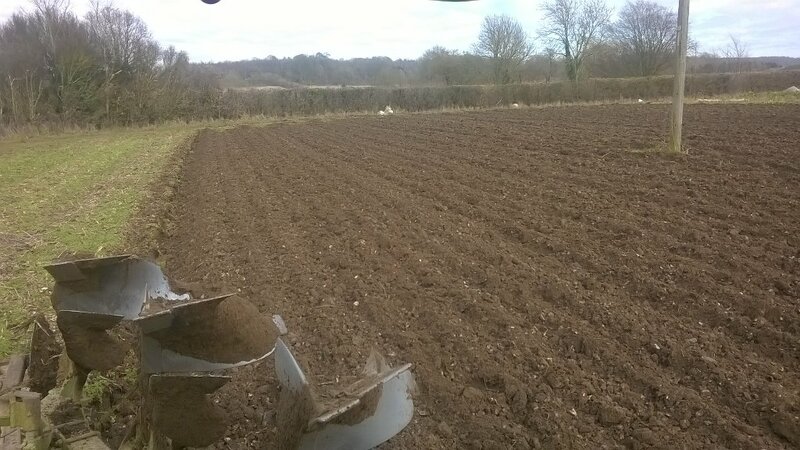 Spring was in the air the last 2 weeks, enabling us to make a start on muck-spreading and ploughing; we’ve even got a few rows of early potatoes in the ground, protected by a cover. Better not get carried away though, it looks a bit less ‘spring-like’ this week. We’ve also made a good start on seed sowing into trays; we grow all our own plants and there are lots of leeks to sow at this time of year, as well as a few trays of kales, spinach, chard, lettuce, spring cabbage and parsley for the first early transplants. We’ve gapped up the patch of over-wintered broad beans by hand, as a lot were killed by the January frosts – a very slow job, that made us appreciate tractors, seeders and transplanters all the more! Winter salads take more work and inspiration than a summer salad of cucumber, lettuce, tomatoes etc but I much prefer them. Grate your squash and roots (carrots, beet, swede, celeriac, parsnip all OK), finely slice brassicas (cabbage, cauli, sprouts, kale, flower sprouts) and leek/onion, and add sweet or spicy dressings, maybe a handful of toasted nuts, or some cheese, or dried fruit or sliced orange – delicious! Here's a few ideas from Chef Ottolenghi - I tend to use his recipes as inspiration, and then substitute or miss out various ingredients to make my own version. https://www.theguardian.com/lifeandstyle/2017/feb/25/winter-salad-recipes-moroccan-carrot-hispi-slaw-daikon-papaya-root-vegetables-yotam-ottolenghi. And our winter salad bags currently contain outdoor, organically grown leaves, picked and packed by hand, and not washed, with no need for chilling. So although there's some valid points in this article, it's not the whole story.https://www.theguardian.com/environment/2017/feb/26/the-eco-guide-to-greener-salads We would like to find an eco-alternative to plastic bags though, we've tried biodegradable ones in the past that have absorbed the moisture from the leaves, so no good for keeping them fresh. We've found some better ones recently, but currently too small and expensive to be a viable option for us. We'll keep looking.